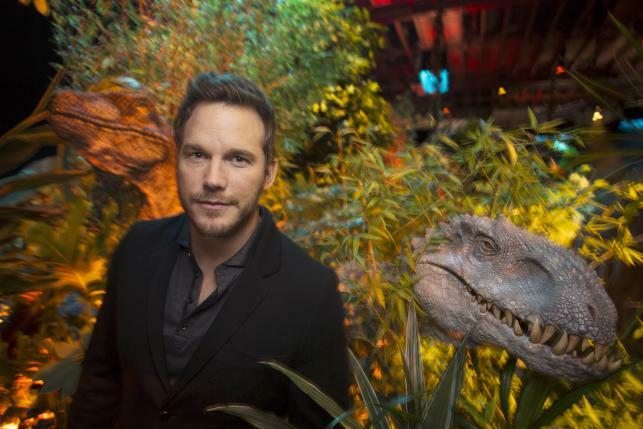 LOS ANGELES – The dinosaurs are bigger, the rides are scarier and there’s a dashing new leading pair as the main attraction: “Jurassic World” is open for business again and hoping to entice a new generation used to getting more bang for its movie buck. But two decades on, as Bryce Dallas Howard’s Claire slyly says in the film, no one is excited about seeing a dinosaur anymore. Yawn. That’s why the theme park in which “Jurassic World” is set needs to amp up the danger for visitors drawn by the adrenaline-fueled experience of getting up close and personal with dinosaurs. Mirroring the film’s attempt to reboot an old franchise with more thrills, the park has hatched a new hybrid creature attraction, the bigger, badder Indominus Rex, created in a lab from a test tube mix of dinosaurs. But the monster has a mind of her own, and as fans of the original franchise have learned, never turn your back on a dinosaur. “Good science fiction always holds a mirror up to current events, to our humanity,” director Colin Trevorrow told Reuters. Made for $150 million by Comcast Corp-owned Universal Pictures, “Jurassic World” is projected to earn $121 million in its opening weekend, making it one of the year’s biggest debuts, according to BoxOffice.com. To play raptor trainer Owen, actor Chris Pratt said he embraced the “swagger” of the hero of one of Spielberg’s most recognizable films: rogue archeologist Indiana Jones. Trevorrow, directing his first big-budget film, said he was eager to twist character archetypes, with Pratt’s Owen initially playing a classic hero to Howard’s uptight and immaculately groomed Claire. It is Claire, however, who Trevorrow said drives the film.